Kavalan has a lot of fans of their very big style of whisky, taking as much from the casks as they possibly can. Am I huge fan? Probably not. I am a big fan of balance in a whisky. When you’re messing with big flavours it doesn’t always do wonders for the balance, which tends to be why I am not a big fan of Bourbon. Nose: Brandy. Not a Brandy-like note, this actually smells exactly like a Brandy. Armangac, artificial raisin, red grape, chocolate powder. Taste: Dry, astringent, quite acidic and bitter, red grape, bitter charcoal, weird Brandy. Finish: Medium/Long length. Weird, rubber, bitter. Not a good whisky, although not a terrible Brandy! 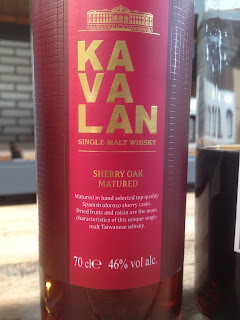 This is example of getting a bit too much from the casks, completely eradicating any whisky flavour.